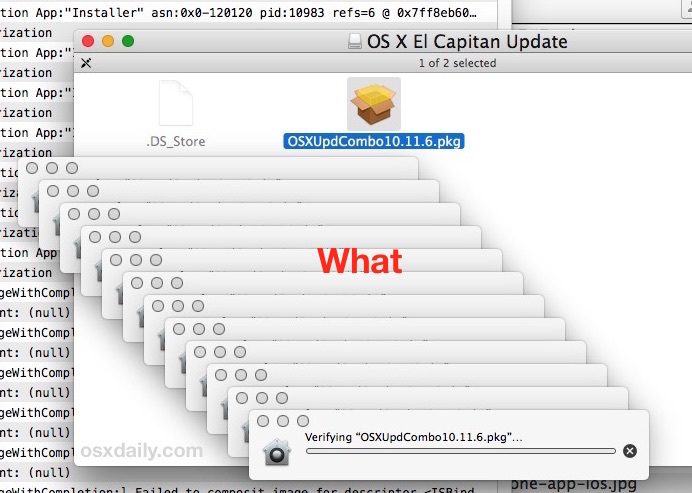 Note: the “Verifying” process for packages, installers, and updates can take a while on any Mac. This is not a troubleshooting guide for merely slow verifications or for those who are simply impatient, this is only for cases where “verifying” process is completely halted and not working at all, thereby preventing the intended installer from running. If you aren’t sure if the “Verifying” process is stuck on the Mac, open the package, disk image, or installer file as usual and let the verification procedure run for a while, it can take many minutes or longer to complete. If the process is still stuck and unchanged an hour or so later, it’s probably stuck. Re-download the installer: Before anything else, you should consider that the downloaded .pkg installer, dmg, or updater may have been corrupted or perhaps is incomplete. The very first step should be to re-download the pkg or dmg in question, and always get it from a trusted source (for example, get the installer or update directly from the developer and never from a third party downloads site). If you know the installer package is legitimate, completely downloaded, and not corrupt through hash verification or otherwise, proceed as usual. The package installer should now work just fine, whether it’s a software update for Mac OS, a third party app, or whatever else was stuck in the verifying stage. This seems to happen most often with installers that are run from a mounted disk image, but it can occur with downloaded .pkg updates as well. Another possible option would be to disable Gatekeeper to prevent the verification process from unidentified and identified developers from running in the first place, but that is really not a good idea as it could open the Mac up to broader vulnerabilities or other issues. For those who like to dig a little deeper to see what’s going on behind the scenes with the failed verifying attempts, you can open the Console app (/Applications/Utilities/) and you’ll typically find messages from launchservicesd and CoreServicesUIAgent with ‘Error -60006 creating authorization’. I ran into this exact issue recently when using a Combo Update for Mac OS X on a particular machine getting it up to date with OS X 10.11.6. Strangely, the verifying process failed and multiplied itself nearly a dozen times, which unsurprisingly didn’t work at all. 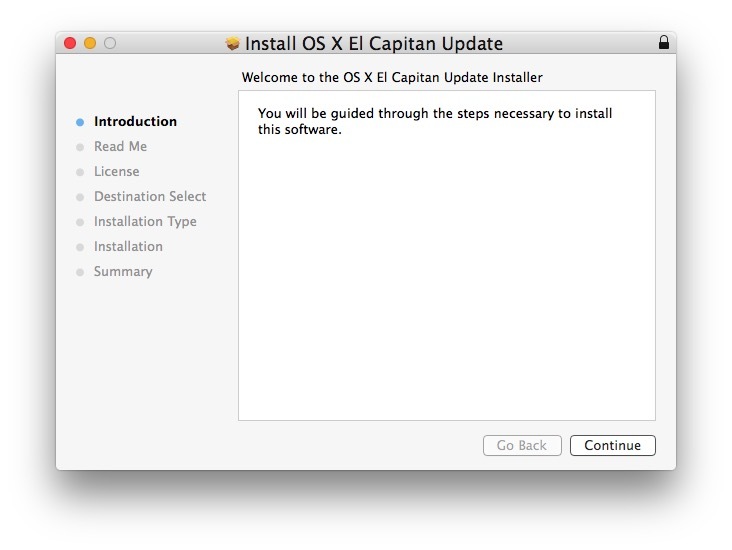 Nonetheless, running the .pkg file through the Installer app allowed the system update to install without a hitch. This is a fairly rare hiccup to occur with installations and updates, but I’ve seen it happen with Microsoft Office, VirtualBox, Mac OS X, and other downloaded updates as well. Did this work for you? Do you know of another solution to this type of issue? Let us know in the comments. I could not get the Finder to locate the Installer.app. But it was easy using an app called EasyFind. So if you’ve got that app, use it. I’ll have to remember this tip. It would have saved me a lot of grief several months ago. I had problems updating to 10.11.5. I downloaded the Combo updater (my preferred update method), and it got stuck “verifying”. Tried again. Same problem. Figuring I just got a bad download, I trashed it and downloaded a new copy. Rinse and repeat. I tried the delta updater. Same problem with that, too. Finally, I just gave up and updated through the App Store. I haven’t had the problem, since (the 10.11.6 Combo updater installed without a hitch). My recommendation would be to do a control-right click on the intended installer then select “Open” from the menu. This will actually tell GateKeeper that this pkg/dmg can be considered an exception and to just allow the installer to open. Does not work every time. Using installer.app does! This worked for me! Thanks – quick and easy. Thanks! Using the installer.app opened every stubborn installer file! Saves a lot of time! I am in the finder and hitting those 3 keys does NOTHING. Your explanations are often way-yyy over my head in your assumptions. Please be SPECIFIC. My ADOBE ACROBAT PRO XI is stuck and I need to figure out how to do this ASAP. 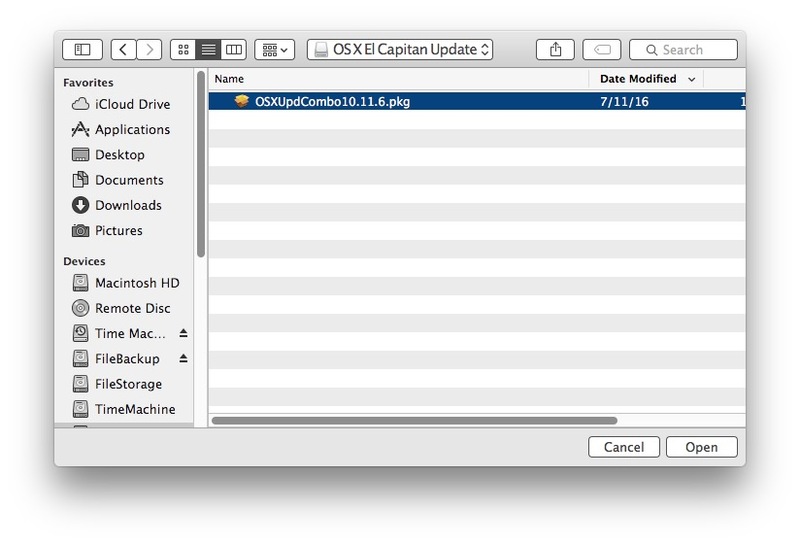 Command Shift G is the shortcut to open the ‘Go to Folder’ dialog in Finder. You have to have the Finder app open to use the shortcut. The other option is to access the dialog by mouse click through the ‘Go’ dropdown menu in the Finder menubar. This option brings up a text entry field that allows you to paste in a filesystem path like ‘/System/Library/CoreServices/’, and Finder will open a window onto that location. Thank you – works like a bomb! This seems awesome but… the .dmg file is greyed out! It works perfectly – Thanks for sharing! Just got stuck on verifying and never worked, but I was able to update my git with your instructions. 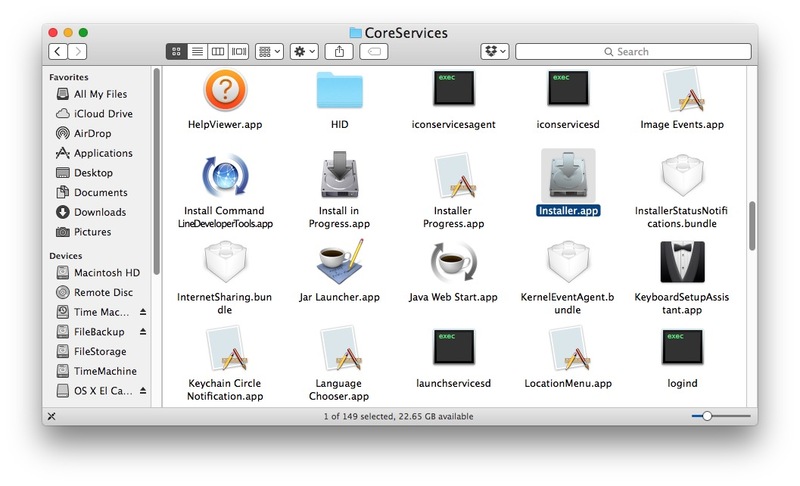 How do I launch “Installer.app” from this directory it directly? And, how to I do step 3 (Navigate to the .pkg file that is stuck on verifying and select to open it)? Hi, Thanks for this it worked! This appears to be my error, but this solution doesn’t quite fit. Followed all above instructions and couldn’t find any unresolved installations (.pkg) files in the relevant folders. Essentially a game I had purchased a couple of months ago was lost when an OS X upgrade to Sierra went horribly wrong. Restored to El Capitan, re down loaded the app (twice & restarted) but it keeps asking for verification repeatedly after successfully entering password. Sense something is missing (apart from a few braincells)? I’ve checked my account details in App Store are up to date, turned off all security between downloads and it’s worn me down. Can’t seem to snag the solution :( Any ideas appreciated, thanks. Thanks! Exactly described and quickly solved my issue! THANK YOU! This worked for me after two days of trying to install. Thanks for publishing this helpful info. Sweet! This worked. Thank you so much. I tried following these steps, but I can’t find installer.app in Finder and I even tried the EasyFind app and nothing came up. I need help. i cant seem to find installer.app in that directory help !! Here’s the tricks i tried yesterday and i made it to successfully bypass all the system file check. Restart is required to make it work. Make sure you return LSQuarantine boolean value back to YES before doing anything else, so you don’t open your Mac to everyone. Thank you, just to precise in french, it’s call “programme d’installation.app” and not “install in progress.app” or “installer Progress.app”. For some reason the Installer.app application won’t open. Is there any kind of solution? Thanks in advance! Apple = we don’t care – we don’t have to. Thanks for these directions. They were just what I needed. The installer.app does not seem to be able to select the downloaded program i’m trying to open. It’s greyed out. Recently encountered this problem where a final cut pro x trial .pkg was stuck on the verifying stage for hours. Problem solved, worked fine! I have been looking for a solution since last night!! And I found it here. YOU ARE AWESOME! THANS YOU!! Worked great. But why does the verifier fail in the first place? How does one fix that? Thank you! Was stuck and this helped me move forward ! Worked like charm! Thank you! I had the same issue but with a .dmg that was greyed-out and couldn’t be selected from within the Installer.app. But the same trick works if you go to /System/Library/CoreServices/ and open the DiskImageMounter.app :) Got me unstuck. hi, I’m trying to do the same but the diskimagemounter.app didnt open. when i’m trying to open the installer.app it can. What should I do? could you help me? Thank You! Saved my day. I can’t find installer.app in the files. I only have installer or installer progress. What should I do? THANK YOU SOOO MUCH. I have been trying to download the same file for months and have looked through every tutorial ever made before finding this, and this worked first try! !